Located in the quiet Hemel Hempstead suburb of Leverstock Green, Woodfield School is a special needs school for young people aged from three to nineteen with severe and complex learning difficulties. The school’s frequently-used hydrotherapy pool was very much starting to show its age and was in desperate need of renovation. Through three years of hard work by staff, parents, pupils, and help and donations from local companies, the school raised £350,000 to get the project underway. The money was then split between constructing a new modern building to house the pool (replacing the previous fibreglass dome in place); building a café alongside it which would be staffed by pupils, with the rest going towards the new hydrotherapy pool. After taking bids from more than 10 companies, it was the proposal for the swimming pool refurbishment put forward by Eden Pools that was found to be most impressive. Eden’s plan would not only give them a pool that the pupils would greatly enjoy, but it would be easier for staff to work with and maintain, save the school money, and give them a much greener footprint compared to the existing pool. Key to this was a comprehensive package from Golden Coast that covered all bases, including pumps, filters, pipework, cover and lighting. The school’s plantroom was overhauled as part of the project. New four-inch pipe work was installed from the pool back to the plantroom. A new 5hp Certikin pool pump and commercial Waterco filter were then fitted, allowing the pool to turnover in just 60 minutes – essential for the school’s regular mother and baby sessions and increasing the pools ability to handle commercial hire. A Triogen Uv sanitation system was installed to cut back on the use of chemicals, alongside a cyclone filter and many new additions to the plantroom. Importantly, the set up was uncomplicated – ensuring the school’s pool handlers could easily operate the equipment, especially in an emergency. As well as changing the depth of the pool to suit users, Eden also insulated the pool’s original walls and floor, before encasing it in fibreglass. A new Calorex Delta dehumidification system was specified as part of the green plans. It does more than simply reduce condensation. The eco-friendly system returns heat lost to evaporation (latent energy) to the pool, as well as energy in the pool air (sensible energy). The smart units feature touchscreen technology that monitors and controls humidity, air quality and air and water temperatures. 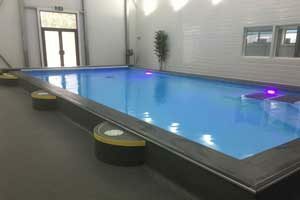 To make the most of the pool’s increased energy efficiency, Eden turned its attention to the pool’s cover. 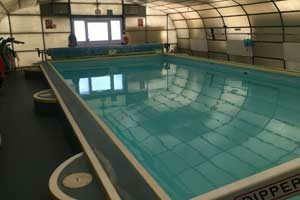 The previous pool had a bubble cover which often proved too heavy for staff to move. As a result, the pool was often left open. As well as losing heat, this created a safety risk. To overcome this, Eden fitted the new DEL Ultima safety cover, which is available exclusively through Golden Coast. The sophisticated design complies with the stringent French safety standard NFP 90-308. It is an especially safe automatic cover because it covers the water completely -leaving no access to the water – even around the edges. Like much of the DEL range, it can be equipped with remote control. At Woodfield, this means staff can now open and close the pool with the push of a button – ensuring the pool can be made secure quickly. Eden pools built a bespoke fibreglass cover housing that houses the Del cover at the end of the pool which is pretty much indestructibly tough and in future projects can be made any size and colour. Being a special needs school, meeting pupils’ sensory needs was high on the list of priorities. 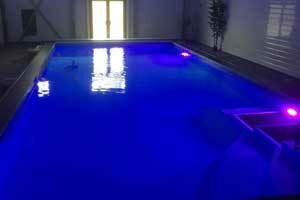 Two Spectravision Moonlight units now feature in the pool. Operated by remote control, they allow for many transitional colour modes. Golden Coast’s Jamie Adams said: “Our success is only possible when our customers succeed. So, we’re thrilled to have seen Eden Pools win the tender and watch the project develop with such impressive results. “Our customers are our top priority. That’s why we strive to give them industry-leading support for everything they do. Our team’s experience and product knowledge can be priceless during specification and ordering and, when the time comes to install, we take pride in offering exceptional support. For more information on the comprehensive range of products available through Golden Coast, contact a member of the sales team on 01271 378100, email swimmer@goldenc.com or visit www.goldenc.com.